Just starting to learn how to write Chinese characters? Or thinking about taking up the brush and starting to learn? Then this article is just for you! We asked Cōngmíng, one of our most experienced 汉字 teachers at Hutong School about her experiences teaching 汉字 to total beginners. And here are her findings and useful tips.Carefully read through them and you’re already better armed in starting this learning journey! 1. 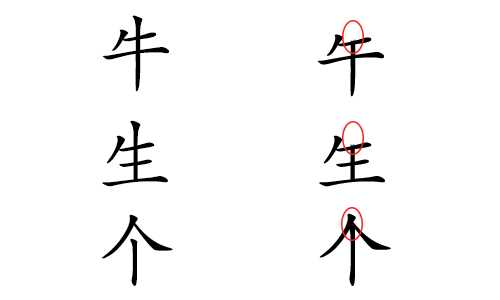 What are the most common mistakes students make when starting to learn how to write Chinese characters? This is an easy one! Most mistakes beginners make are with stroke order and stroke direction. As the structure of Chinese characters is totally different from the Roman alphabet for instance, students very easily mix up the rules of the strokes. Calligraphy allows you to see much clearer how a stroke has been written. As the ink is much thicker where the brush first touches the paper (the start of the stroke), you clearly see what direction the calligraphy master has used to write this particular stroke. 2. What tips you always give students learning how to write Chinese characters? Tip #1: Start with the right tools! The first thing that’s really essential when learning how to write Chinese characters are the textbook and software you will use. At Hutong School, we have carefully selected textbooks specialized in teaching 汉字 for each level and furthermore simply love Skritter, as we find it the best app to learn how to write characters. Choosing the right book and software is the first step, if not the most important one, in learning Chinese characters. They are as essential to your learning process as weapons are to a war. Tip #2: Follow the instructions carefully! Your textbook is king. Follow the instructions on stroke order and direction very carefully. 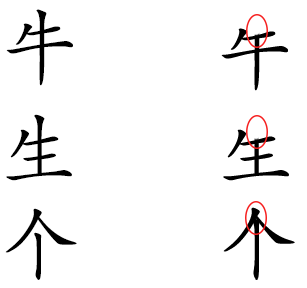 As we like to say, writing Chinese characters is actually not difficult, it just comes down to copying. As a student, you don’t need any creativeness. The hardest part is remembering how to write it, that’s it. I often need to tell my students they can’t just change the way of writing characters to their liking. It’s a fixed science so to say, just like math (2+3 will always be 5). memory trick: It’s like the head, you can’t cut it off, or there’s no life anymore. Lastly, love characters. Students who use their heart, don’t find writing characters difficult. The hardest part is simply to remember how to write them. I always say: Chinese characters are the world’s most beautiful characters. The beauty of it lays in the wisdom and cultural changes of this nation embodied in them. What mistakes are you encountering when first starting to learn how to write characters? Or do you have any other questions you would like to ask the team of teachers at Hutong School? Write it in the comments! With over 10 years’ experience, Hutong School is one of the leading Chinese language schools in Beijing and Shanghai and offers language programs for everyone eager to learn Chinese Mandarin. Their Chinese classes are characterized by their small group size, individual attention to students’ needs and highly qualified and motivated teachers. Find out more on learning Chinese in China on their website.